Warner Bros. and Turner Classic Movies is presenting the Charlie Chan Collection, a four-movie set of Chan's adventures during the Monogram Pictures era. Each film was previously unavailable on DVD. Dark Alibi (1946): Following a bank robbery and the murder of a guard, a man with a criminal past is arrested. The man's fingerprints were discovered at the crime scene, and as this is considered definitive proof of his guilt, he is subsequently convicted and sentenced to death. 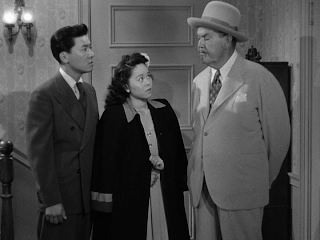 Detective Charlie Chan (Sidney Toler) overhears the man's daughter pleading with an attorney, as the final appeal has been denied, and he decides to take the case. Chan and his Number Three Son, Tommy (Benson Fong), and his chauffeur/assistant, Birmingham Brown (Mantan Moreland), set out to prove that the fingerprints were planted and that an innocent man is on Death Row. Toler had starred in 11 Charlie Chan films produced by 20th Century Fox. After the studio dropped the series, Toler bought the screen rights and convinced Monogram Pictures to begin distributing the films, beginning with 1944's Charlie Chan in the Secret Service. The actor makes a fine Charlie Chan, and he plays the role with humor, flashing a jaunty smile when he's either caught someone in a lie or hears an expected response during questioning. Watching Chan's investigation is enjoyable, but it's more fun following Chan's son, Tommy, and Birmingham, and Fong and Moreland have good chemistry together. However, the film's highlight involves scenes with Moreland and Ben Carter. The two men had a vaudeville act together, and one of their routines, in which neither man can finish a sentence, is on display in Dark Alibi (which also makes an appearance in 1945's The Scarlet Clue). The sequences are a delight, especially with a flustered Tommy trying desperately to follow the two. Dangerous Money (1946): An agent of the Treasury Department is aboard a cruise ship bound for Samoa, working undercover to investigate "hot money" on the island. 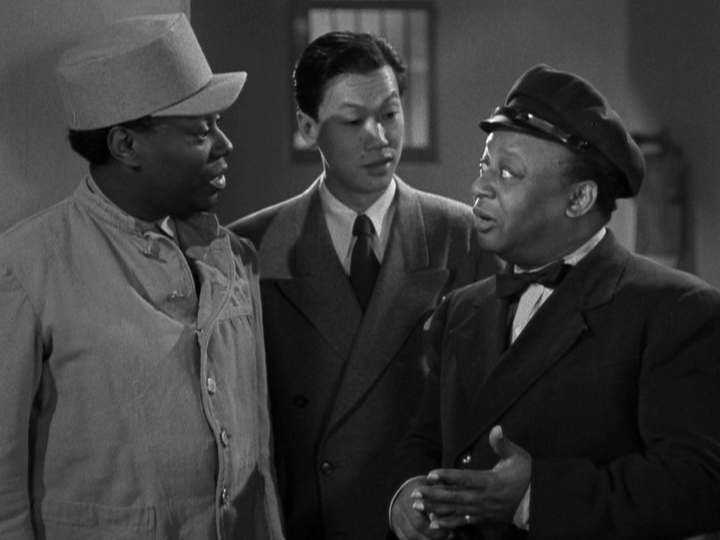 Fearing for his life, he asks for help from fellow passenger Charlie Chan (Toler). No sooner does Chan agree to take the case than the agent slumps over with a knife protruding from his back. While Chan's Number Two Son, Jimmy (Victor Sen Young), and chauffeur, Chattanooga Brown (Willie Best), try to discreetly secure the passengers' fingerprints, the detective questions the people on the ship, hoping to expose secrets, lies, and a murderer. Perhaps the most significant trait of Dangerous Money is its wonderful setting on the cruise ship. Not only does it heighten suspense with a claustrophobic ambiance, but it creates paranoia among the passengers since it almost guarantees that a murderer is one of them. Even when the people make it to the island, the place seems so small that the tight atmosphere is retained. Although not as sprightly and animated as Fong and Moreland, Young and Best as Jimmy and Chattanooga are still lighthearted comic relief. The Trap (1946): A variety troupe head to a beach resort for a month of relaxation. One of the performers, Marcia, blackmails Lois (who had lied about her age to join the troupe) into stealing a tin box of letters from another room. During the attempted theft, Lois is strangled to death, and upon discovery of her body, the others realize that Marcia has disappeared. One of the women, San Toy, suggests getting help from "the world's greatest detective," Jimmy Chan (Young). 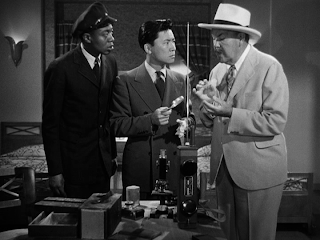 Soon after, Charlie Chan (Toler), along with his son and Birmingham (Moreland), joins the case, and encounters a great deal of people pointing fingers at one another. This was Toler's final film, as he died shortly after its release. Reportedly, he was so ill during filming that he had trouble speaking his lines and even standing. But if such was the case, it hardly dampens his performance, as Toler's Chan was always methodically and deliberately slow in his speech and demeanor. Charlie Chan did, admittedly, tend to take a backseat in this film to Jimmy and Birmingham, who both shine in larger roles. Jimmy's scenes with his lady friend, San Toy, both of whom clearly share a mutual attraction, are a treat, and the two are good together. The Trap is probably the best film of the bunch, as there are quite a number of suspects, making it an entertaining affair when trying to unveil the killer. The Chinese Ring (1947): A Chinese lady arrives at the house of Charlie Chan (Roland Winters), refuses to give her name, and hands a ring to Birmingham (Moreland) so that he can show it to the detective. While waiting, the woman is killed by a suspect unknown, utilizing an air rifle at a nearby window. Chan and Sgt. Davidson learn that the woman was Princess Mei Ling, and the only clue to her murderer's identity is a "Capt K" that she was able to write before she died. Chan's investigation leads to an acquisition of airplanes, vanishing money, and a masked killer desperately trying to cover his/her tracks. Toler had starred in 11 films for Monogram before his death. The Chinese Ring is the Chan debut for Winters. His interpretation of the Chinese sleuth is intriguing, much more straightforward and serious than Toler. While it may be strange to see a non-Asian actor playing Charlie Chan, it's certainly more noticeable in The Chinese Ring, as much of the supporting cast is comprised of Chinese characters, refreshingly portrayed by Asian actors. It's unfortunate that both Jimmy and Birmingham have little to do in this film, but Warren Douglas as Sgt. Davidson and Louise Currie as Peggy Cartwright, a reporter, are paired together, and they provide some humor in their shared scenes. Winters would star in five additional Charlie Chan films before Monogram Pictures officially ended the series with Sky Dragon in 1949. The DVD presentation of all four movies is crisp and, for the most part, clear of scratches. The audio is likewise exceptional, and the packaging is outstanding, with each film getting its own disc. The DVD collection is set for release tomorrow, June 8th, and will be available at TCM's website, as well as additional online retailers. Sark, this is a splended review of four Chan films. As you know, I love mysteries with confined settings, so DANGEROUS MONEY sounds right up my alley. I saw most of the Oland and Toler CHARLIE CHAN films as a kid and always enjoyed them. Whereas the comic relief in some "B" mysteries don't age well, that's not true of the Chan pics. I think that's because the actors who played Charlie's assistants were talented comedians. I haven't seen any of the Roland Winters films, which makes this collection sound intriguing. Very nice review on this set of films, Sark. I haven't seen a Charlie Chan movie in many years. It is amazing how some of the really old classics are coming out now on DVD. Thanks for information, Sark. These sound great. I have my set on order. "The Chinese Ring" is a remake of "Mr. Wong in Chinatown." 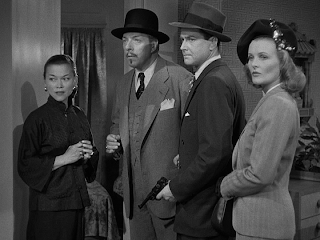 Later on Monogram again recycled one of their earlier Wongs for another Roland Winters Chan mystery, with "Mr. Wong, Detective" being remade as "Docks of New Orleans." First time at this site. Great review of these Chan films. I'm a big CC fan. Toler is the best!! Mantan Moreland is hilarious! So is Benson Fong! Sorry I am so late in responding to your wonderful reviews of these four Charlie Chan films, Sark. I always enjoyed Charlie's wise sayings and his numbering of his sons. And Becky, your story about your high school beau really made me smile! I want to revisit these films again. Thanks for reminding me about them!